← Laminate flooring ~ why is it not laying flat? Power washing is a quick effective way to clean your home if done correctly. If you just want to clean your home without having to paint it you must take care not to damage the paint or caulking by using too much pressure. Many pressure washers can produce over 3000 psi of pressure at the tip, which is powerful enough to gouge siding, erode cement or cut through skin, muscle and bone! So before we go any further lets discuss some safety points. wear safety glasses, goggles or face shield while pressure washing. Water conducts electricity: Use caution around service panels, meter bases, overhead wires, electrical outlets and exterior lights to prevent electrocution! Always be aware of where you are spraying and where you are going to spray next. Mufflers get HOT: If you are using a gas powered pressure washer always remember to avoid touching the muffler. When starting an engine it is common to place one hand on the engine to steady it while pulling the starter cord with the other. Many engines have mufflers located in a position that you might be tempted to place your hand to steady it when pulling the starter cord. 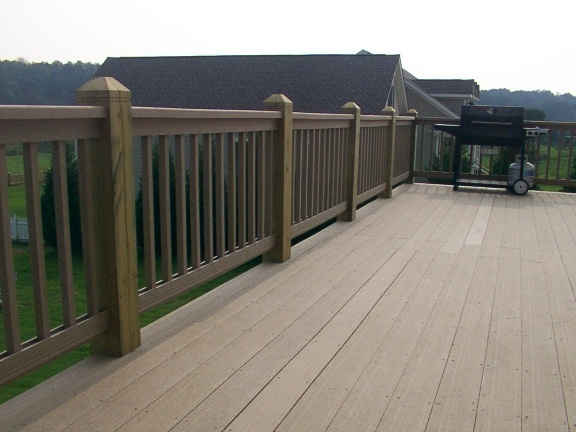 Never use the high pressure jet tip or the narrow fan tips close to the siding. 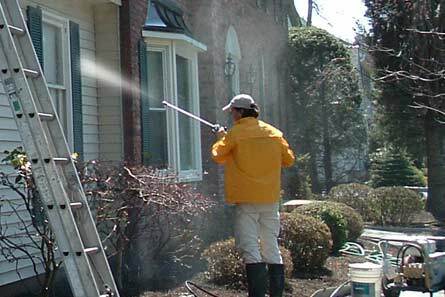 Never direct the spray at yourself or others as the pressures generated by power washing are extremely dangerous. It is OK to use the high pressure tip to reach high areas on the house. Just be aware of the extreme pressures generated and use common sense in not allowing the jet to damage the house. Pay close attention to where you are spraying. The high pressure will force water under or around doors and window and into wall vents, soffit vents and attic vents. Thoroughly soak one area or wall at the time with clear water along with any nearby plants. Immediately go over the same area again, this time using cleaning solution, and allow the cleaning solution to work for three to five minutes. You can repeat the previous steps on the next area while waiting for the cleaner to work on the first area, just don’t let it dry before rinsing. Once the cleaning solution has had time to work on an area for a few minutes rinse it down completely with clear water until all sign of soap residue is gone. Never let the cleaning solution dry on the wall as it will redeposit the dirt that had been loosened. Remember to rinse down any plants that may have come into contact with the cleaning solution. When power washing is completed inspect the entire house, especially around doors and windows to determine if any caulking or paint was damaged . Allow house to dry thoroughly before applying any caulking and paint. Power washing can be a challenge for some but the benefits of a clean, attractive and well maintained home easily justify the time and expense of this project. Thank you for the information on using a power washer safely and for some ideas on what kind of cleaner to use. How much different is cleaning a driveway from cleaning a house? I am happy you found the article helpful. Depending on what you are cleaning off your driveway you may need different cleaning products than are used to clean your house. Oil or grease stains require a detergent while mildew stains require Clorox or a mildewcide. Higher pressure can be used on concrete but using a spray wand will likely result in an uneven streaky appearance when the concrete dries. Moving the wand at different speeds, holding it at different heights and going over some areas more times than others all result in uneven cleaning. A flat surface cleaner attachment provides better results on walkways and driveways. Nice tip’s, I plan on doing a whole house with roof and side buildings, very soon. These tips will come in handy, thanks. It’s important to know how strong pressure to use on wood. People are almost always setting the strongest pressure but that can do damage on the surfaces that you are cleaning. That is very true, using the correct spray tip to control pressure and flow is an important part of any good pressure washing project.